On paper, where does the newly launched Volkswagen Tiguan stand in relation to its competitors? After a long wait, Volkswagen has finally launched the Tiguan. Priced at Rs 27.98 lakh for the Comfortline trim and Rs 31.38 lakh (ex-showroom Delhi) for the Highlight variant, the Tiguan directly competes against the Toyota Fortuner and the Ford Endeavour. Let’s take a closer look at where the Tiguan stands against its competition. Volkswagen has launched the Tiguan with just a 2.0-litre diesel engine option. This unit is good for 141bhp and max torque of 340Nm. The engine only comes mated to a 7-speed DSG. There is no manual transmission option on offer. The Tiguan comes with an all-wheel drive system. 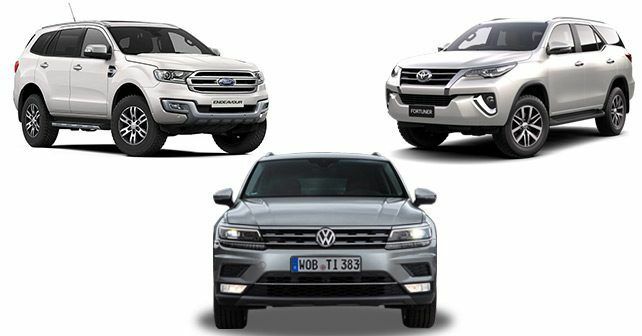 Of the three cars in this spec comparison, the Toyota Fortuner is the only one that comes with a petrol engine option. The petrol-powered Fortuner sports a 2.7-litre engine that makes 164bhp and 245Nm. The diesel Fortuner, on the other hand, gets a 2.8-litre powerplant that makes peak power of 174bhp and max torque of 450Nm. Both engine options come paired with an automatic as well as a manual transmission. The petrol Fortuner is not available with a 4x4 option. The Ford Endeavour too comes with two engines – both diesels. The smaller 2.2-litre engine produces 158bhp and 385Nm and comes with the option of a manual as well as an automatic transmission. It is only in the manual transmission option that the Endeavour 2.2 is available with a 4x4. The larger 3.2-litre motor only comes mated to an automatic gearbox. At 197bhp and 470Nm, the Endeavour 3.2 is the most powerful among the three cars here. With this engine option, the base Trend and the top-spec Titanium variants come with a 4x4 option. The Volkswagen Tiguan comes loaded with features like LED headlamps with DRLs, cornering lights, ORVMs with memory function, dual-tone bumpers and a panoramic sunroof. One of the most interesting features on the new Volkswagen Tiguan is undoubtedly the self-sealing tyres. In terms of safety, the Tiguan gets driver/passenger/side/curtain airbags, ABS, ESC, Hill descent control and Active Pedestrian Safety. Toyota too has fitted the Fortuner with an equally long list of features. LED projector headlamps with DRLs, LED taillights, roof rails and more. In terms of safety, the Fortuner comes with 7 airbags, ABS, EBD and ESP. The Toyota is the only car among the three that doesn’t come with a sunroof though. In terms of tech, the Endeavour is the most equipped of the lot. It comes with a Terrain Management System that helps it in tackling off-road conditions. In addition to all the aforementioned features from the other two cars, the Endeavour gets an electric folding third row, lumbar support for the driver and the passenger, three 12v charging points, and more. The Volkswagen Tiguan is on sale in just two variants – Comfortline and Highline, priced at Rs 27.98 lakhs and Rs 31.38 lakhs respectively. The Toyota Fortuner, on the other hand, ranges from Rs 26.66 lakhs to Rs 31.86 lakhs respectively. The Ford Endeavour has the lowest starting range of the lot at Rs 25.49 lakhs while the top-end is priced at Rs 31.5 lakhs. All prices ex-showroom Delhi.